Each teardrop banner comes with a handy carry bag. Single side banner with full colour printing. Includes rods, carry bag. Single side banner print. Single side banner with full colour printing. Includes rods, carry bag and stake. Single side banner print. Double sided banner with full colour printing. Includes rods, carry bag. We have a few choices of bases for teardrop banners and feather banners. Our bases are fully compatible with all our banner styles and sizes. 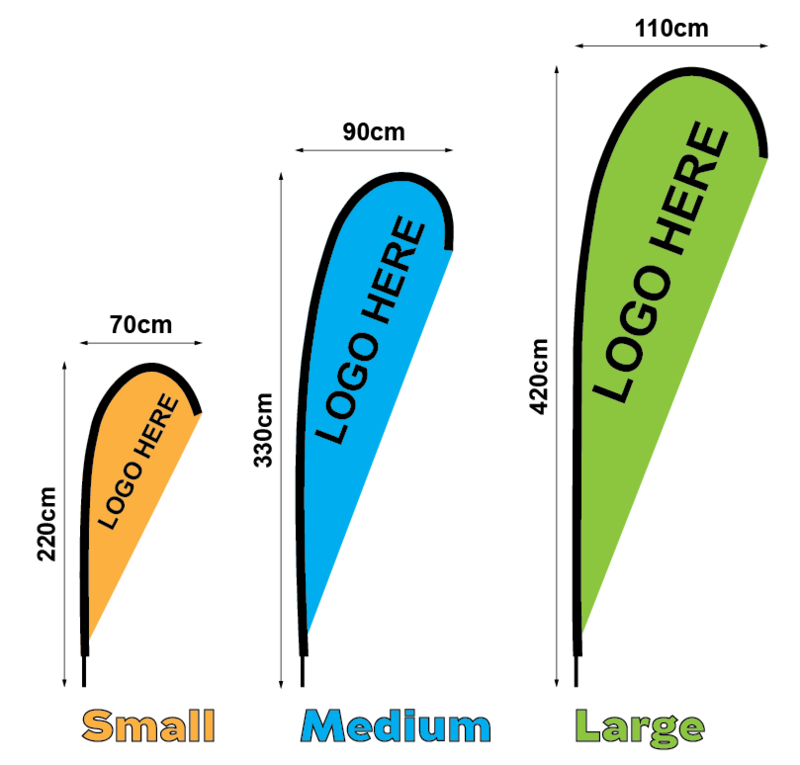 Our range of teardrop banners is the perfect way to maximise on your marketing mix when next doing an event. This portable , light weight range of signage is designed for easy use and you can have banners up within a matter of minutes. The banners can be used on hard surfaces and soft surfaces and the banner will move in the wind attracting attention. Flying Banners is another term used for teardrop banners. Flying banners are available with single side full colour print and double side full colour print. Sizes range from 2mt, 3mt and the large 4mt flying banner. Earth stake bases are available for grass and sand and cross feet with water bags are available to use on hard surfaces. Who uses teardrop banners and flying banner? Teardrop and flying banners are popular for all events and promotions. Corporates, sports clubs and schools all have different events running throughout the year. Triathlons and all sports events can strategically place banners along the designated course. Promotional and event companies can digitally print banners to get maximum exposure for a new product or brand. Teardrop banners are always popular at motor bike and motor cross events. We can assist you with layouts if you can provide vector outlined artwork files. The procedure is simple, once artwork has been approved we can deliver in approximately 7-10 working days from artwork sign off. You can print with no colour restrictions and if you wish to use graphic images on your banner this can be done.